The 1976 French Grand Prix was a Formula One motor race held at the Circuit Paul Ricard in Le Castellet, near Marseille in France, on 4 July 1976. It was the eighth race of the 1976 World Championship of F1 Drivers and the 1976 International Cup for F1 Constructors. 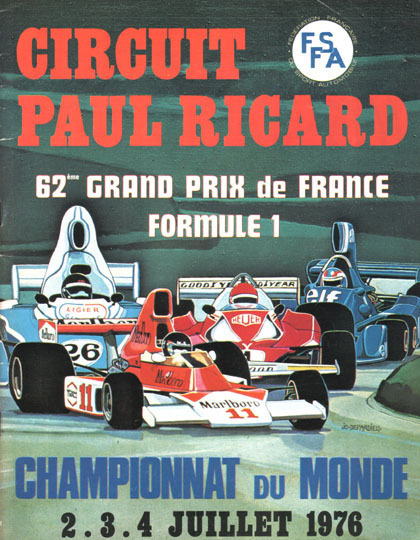 It was the 54th French Grand Prix and the fourth to be held at Paul Ricard. The race was held over 54 laps of the 5.8-kilometre (3.6 mi) circuit for a race distance of 313 kilometres (194 mi). The race was won by eventual 1976 world champion James Hunt driving a McLaren M23. Hunt won by twelve seconds over the Tyrrell P34 of Patrick Depailler. It was Hunt's second win for the year and his third career Grand Prix victory, although at this stage his appeal against disqualification from the Spanish Grand Prix win had yet to be upheld. Eleven seconds further back in third was John Watson driving a Penske PC4. It was the first podium finish for both Watson and Penske, although the result only came after Ronnie Peterson's March 761 stopped with three laps to go and after Watson was disqualified for a rear wing irregularity and subsequently reinstated upon appeal. Fourth place was taken by young Brazilian driver Carlos Pace driving a Brabham BT45 ahead of Mario Andretti (Lotus 77) and the Tyrrell P34 of Jody Scheckter. Reigning champion Niki Lauda retired his Ferrari 312T2 with an engine failure while leading. While Hunt would eventually prove to be the challenger to Lauda for the 1976 championship Lauda's points lead at this time was over the Tyrrell pair of Patrick Depailler (26 points) and Scheckter (24 points). Ertl had failed to qualify, but he had started on the back of the grid. Note: Only the top five positions are included for both sets of standings. Only the best 7 results from the first 8 races and the best 7 results from the last 8 races counted towards the Championship. Points accurate at final declaration of results: before the next race in Britain, Hunt was reinstated as the winner of the Spanish Grand Prix. ^ "Motor Racing Programme Covers: 1976". The Programme Covers Project. Retrieved 20 October 2017. ^ Lang, Mike (1983). Grand Prix! Vol 3. Haynes Publishing Group. p. 130. ISBN 0-85429-380-9. ^ "France 1976 - Qualifications • STATS F1". www.statsf1.com. Retrieved 11 April 2019. ^ a b "France 1976 - Starting grid • STATS F1". www.statsf1.com. Retrieved 11 April 2019. ^ "1976 French Grand Prix". formula1.com. Archived from the original on 10 December 2014. Retrieved 23 December 2015. ^ a b "France 1976 - Championship • STATS F1". www.statsf1.com. Retrieved 15 March 2019.